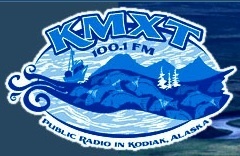 KMXT is a non-commercial radio station in Kodiak, Alaska , broadcasting on 100.1 FM and streaming at kmxt.org. We also broadcasts 2 additional HD channels at 100.1 with HD2 and HD3 and now have an additional sister analog station, KODK, that broadcasts locally at 90.7 FM. The station airs public radio programming from the National Public Radio network, Alaska Public Radio Network , American Public Media, PRI and the BBC World Service . #101 Family Show 59 minute show for kids of all ages.